CARACAS (Reuters) – Venezuela will sell 15 tonnes of gold from central bank vaults to the United Arab Emirates in coming days in return for euros in cash, a senior official with knowledge of the plan said, as the crisis-stricken country seeks to stay solvent. In total, the plan is to sell 29 tonnes of gold held in Caracas to the United Arab Emirates by February in order to provide liquidity for imports of basic goods, the source said, requesting anonymity in order to speak freely. Socialist President Nicolas Maduro is under intense pressure to step down, with Venezuela in deep economic crisis and the government facing widespread international condemnation for elections last year seen as fraudulent. The United States, which is backing an attempt by the opposition to oust Maduro and call new elections, warned bankers and traders on Wednesday not to deal in Venezuelan gold. Maduro’s government resorted to selling off gold about a year ago after falling oil production, the country’s wider economic collapse and mounting U.S. sanctions hit public income and made it hard for the country to access credit. But the sale of large volumes of the reserves underpinning the currency is a significant escalation that countries only generally resort to in the most dire financial straits. By contrast, Maduro’s mentor, the late President Hugo Chavez, cited the need for Venezuela to have physical control of central bank assets. In 2011 he repatriated around 160 tonnes of gold from banks in the United States and Europe to the central bank in Caracas. Some Chavez loyalists are critical of Maduro’s gold sales. Gustavo Marquez, a former trade minister under Chavez, said the government should not keep such operations in the dark. “We don’t know what is exported any more, or under what conditions. They are operations that should be transparent,” he said in an interview. Times have changed from the largesse of the Chavez era. Oil prices plummeted after Maduro took office in 2013 and he has overseen a sharp drop in oil production but tried to keep up spending, leaving the government increasingly unable to pay debt or access new credit. The 3-tonne shipment that left Maiquetia airport on Jan. 26 was transported on small Venezuelan cargo airline Solar Cargo to the United Arab Emirates, the source said. The same airline will be used to ship 15 tonnes as soon as Friday, and 11 tonnes in February, the source said. A person who answered the phone at Solar Cargo denied the company was involved in transporting gold, then hung up. In recent days, the arrival of two Russian-operated planes at Maiquetia fired up rumors in Venezuela that they would leave with gold on board. That was incorrect, the source said, and has been denied by Moscow. Buyers in the United Arab Emirates pay Venezuela with cash in euros for the gold, said the source, who did not mention which companies were involved in the transactions. The government told businesses that it was winding down its own imports of basic products, the sources said. Maduro’s socialist government has for years imported basic products, from rice to toilet paper, to sell at subsidized prices. That appears to be changing as sanctions make it harder for foreign companies to do business with the Venezuelan state. Between January and September of 2018, Venezuela exported $900 million of unrefined gold to Turkey, according to Turkish government statistics. 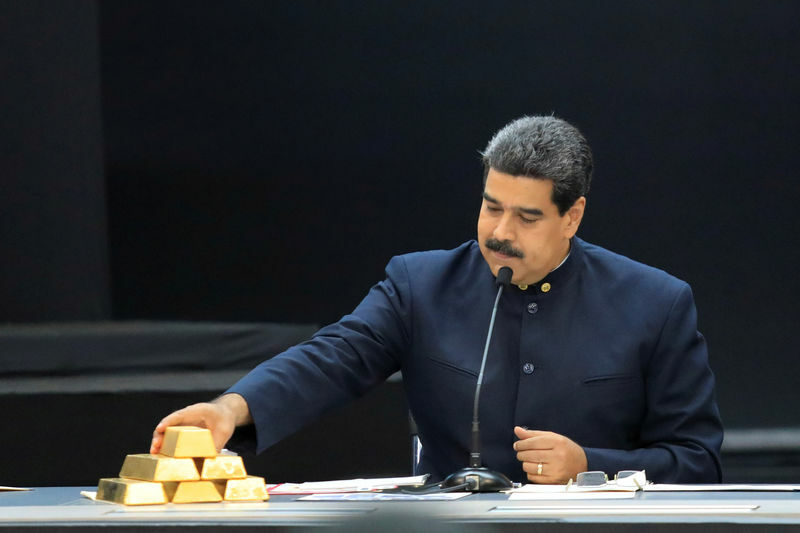 But once supplies of unrefined gold from Venezuela’s small-scale mines ran low, the central bank began to sell gold reserves to allied countries, the source said. Central bank data shows a decline in gold reserves over the past year. In January 2018, the bank held 150 tonnes of gold. By November holdings had fallen to a 75 year low of 132 tonnes, central bank data showed. Calixto Ortega, president of Venezuela’s central bank, met with Bank of England officials in December to discuss repatriating the gold it holds but was unable to convince them, according to sources familiar with the situation. Rubio said that a “French national” working for Noor Capital was in Caracas “to arrange the theft of more Gold from #venezuela.” Noor Capital is an Abu Dhabi-based financial services company. It did not immediately respond to request for comment outside of office hours.